Jenan Al Oraibi is married to Ali Abdulemam, known as the Bahraini Blogger, who was sacked from his airline IT job after he was arrested in September and accused of being part of a terror organisation. He was charged with spreading false information and linked to a group of Bahraini oppositionists who had been arrested in August. Like Mr Abdulemam, they have frequently voiced their criticism of a government they consider undemocratic and discriminatory toward Shia, who are the majority indigenous population. The ruling Al Khalifa family are Sunni Muslims. 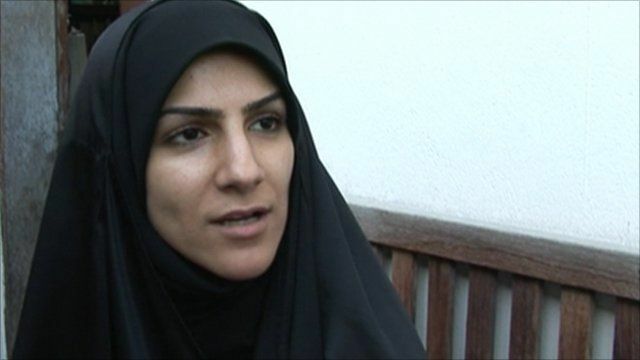 Ms Al Oraibi denies that her husband is a member of a political party or a Shia activist, and thinks her husband was imprisoned only for expressing his opinions. The Bahraini government denies wrongdoing and told the BBC in a statement that: "Standard procedures are applied fairly to all detainees in custody in line with the law. Their rights are being protected and no mistreatment has occurred." You can hear more about this story on Crossing Continents on BBC Radio 4 on Thursday 16 December at 1100 GMT and Monday 20 December at 2030 GMT. You can also listen via the iPlayer or download the podcast.